Oh absolutely. It worked for sure. It's sub-perceptual. In fact, if I told you right now, "Hey Mark, I slipped a microdose of LSD. in your coffee," you wouldn't even know the difference. The effect for me was instantaneous. My depression lifted right away. 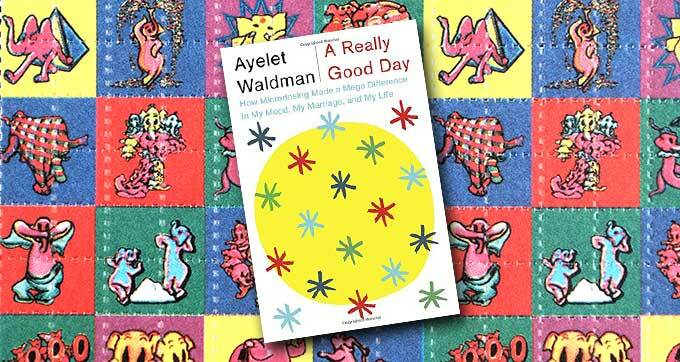 The book is called A Really Good Day because at the end of that very first day, I looked back and I thought, "that was a really good day." It wasn't like everything was perfect. It wasn't like I was happiness and sunshine. I was still me, I was still cynical, I was still occasionally irritable, I would still sometimes make rash decisions, but I was stable and I was experiencing the kind of contentment and stability that people without mood disorders feel, and that really was quite nearly instantaneous. My wife and I fought each other over who got to read your book at night. We just tore through it. One thing I noticed was that as time went on, on the days you microdosed, it became a little tougher for you to deal with the physical sensations. Yeah, I got a little more irritable. I think if I were to continue I would probably take a smaller dose, maybe a five microgram dose every other day, rather than ten micrograms [every three days], because it made me a tiny bit irritable. Nothing like the way I was before I was using it, when I would fly off the handle and send rage-filled tweets and that kind of thing, but it definitely made me a little irritable, a little grumpy, a little agitated sometimes. Once I even told a physical therapist who was treating my frozen shoulder that I was microdosing. That was an impulse control moment. So there's definitely that side effect. The best day is the second day, the first day after you microdose. The protocol that Jim Fadiman, who kind of popularized microdosing, came up with is you dose one day, you don't dose for two days, and then you dose the fourth day. The second day is the day that I (and most people) felt the most positive results. There was less irritability and there was more equilibrium -- equilibrium, Mark, that's what I experienced that was so glorious. After your 30 day experiment, your supply of LSD was used up and you stopped. Did you look into continuing using something like morning glory seeds or Hawaiian baby woodrose seeds that contain psychedelics similar to LSD but aren't Schedule 1 substances? I'm not a real chemist by nature. I'm not an experimenter by inclination, though I realize that I did try this experiment. So I'm not really comfortable trying things like that because I don't know what the effects are. I think that if I sink into that kind of depression I'll be willing to try anything, including those things. I'm hoping that we have a dramatic change in the law. My hopes for that are somewhat less than they were before November 8. But I think that as microdosing becomes more popular, and people start experimenting with those kinds of legal substances, then I might feel comfortable trying them. You know, anytime people come up with a medication regimen or a drug regimen that makes him feel better, the government tends to quickly criminalize it. So don't say "morning glory" too many times or the next thing you'll know you'll find it on Schedule 1. Yes, and you're speaking as a former federal public defender. And as someone who taught a class for seven years at the University of California Law School on the legal and social implications of the War on Drugs, and I was a consultant for the Drug Policy Alliance so when it comes to drug policy and drug law I know my stuff. You also did a great job sharing anecdotes about drug policy and harm reduction in your book. One of the most infuriating and heartbreaking anecdotes you included was about defending a woman who'd been entrapped by a Drug Enforcement Administration informant. This was a mother who never committed a crime in her life. She thought she had fallen in love with someone, and he was this vicious, vile person. He had been found not guilty by reason of insanity for the attempted murder of his wife. He'd escaped from prison. He became a CIA informant in Central America afterwards, and then the DEA hired him. He had stolen money from the DEA and failed a lie detector test. So they shifted him over to work in a different jurisdiction and that was the person who was busily setting up first time offenders. It was madness. The institutional sociopathy of the DEA and the CIA is really horrible and it makes me wish that, especially where we are right now, that you'd go back to being a federal public defender. We need people like you. A few months ago I thought, "What am I going to do next? Maybe I'll write a nice light hearted novel about something." Now I realize that what I'm going to do next is a book that is more policy focused. I think that the times call out for social activism, and I'm really glad that I have this book out now because this book isn't just about an experiment with LSD. It's about the drug war and the racist underpinnings of the drug war. And about the history of psychedelic drugs and other drugs and the problems with mass incarceration and the neurochemistry of psychedelics. It is a kind of social activism, and I feel like that's where we all need to spend our time in any way that we can, especially those of us who come from a place of privilege. An African-American who lives in Detroit and who is suffering the way I was suffering wouldn't be able to write this book and be so public because the risks to him would be so great. So people like me who benefit from white privilege have an obligation to use that privilege to help others, and that's what I'm trying to do.